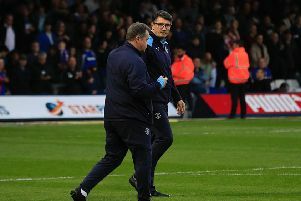 Luton will do their utmost to hang on to their star players during the final few days of the transfer window, according to interim boss Mick Harford. The Hatters have seen several of their promotion rivals weakened already this month, with Sunderland selling top scorer Josh Maja to Bordeaux, while Portsmouth’s loan trio and Ben Thompson, Andre Green and David Wheeler were all recalled by Millwall, Aston Villa and QPR respectively. Barnsley have sold Brad Potts to Preston North End, with George Moncur snapped up by Luton, while reports suggest Charlton’s Karlan Grant will leave the Valley as well. Although Harford anticipates being tested in the final few days, when asked about his hopes on them all staying put when the deadline passes at 11pm on Thursday, he said: “It’s massive. “We’ve got a good squad, we’ve got good players, me in the interim position as we are, I’d like to win games and I wouldn’t want to lose any of the players, any of them. “I think there has been a lot of attention on all of our players, as we’ve been climbing the table. “We have a good way of playing, have a good structure to the team and people like the way the team play. “We’ve got some good footballers and some good players who will be big assets for other clubs. "But we’ll try and hang on to them and hopefully we can get where they want to be at the end of the season. “The lads’ attitude is spot on and they want to do well at the club they’re at. With the likes of Jake Jervis, Luke Gambin and Jack James all currently out on loan, Harford did confirm a few more might head out to gain some much needed game time. He added: “We might lose one or two.